**This is my second post today. Please scroll down or click here to see my Wplus9 August/September Release Group Post! 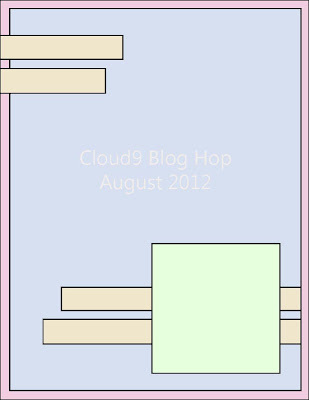 It's the 9th which means another blog hop with Cloud9! Guess what? After last month's hop, I won the guest spot with the Inspiration Team :) This month's challenge is to make a project using the following sketch and one Wplus9 image. I used lots of Wplus9 products on this card! I started by stamping the wreath from Spring Tags and layered it using the Circle Stackers 1 and the Label Layers 4 dies. I placed that over two banners cut using the Banners Trio die! Then I stamped and die cut a heart from Heartfelt Mix and added that to the center of the wreath. Some simple pearls and a single button are the perfect finishing touches to this soft and girly design!!! I can't wait to see what you do with this sketch!!! Maureen--I love your take on this sketch-the banners are my favorite. Love the pink and green together. Great job!!! Maureen! Thank you so much for joining us this month. You have been a Wplus9 Stamping Rockstar all week and we're so thrilled to have you with us. I love your card! Everything is layered so beautifully. I especially love how you've pulled from several different sets...I need inspiration like that! Your use of dies and layering is unbelievable! I adore the fresh look of this card, right down to the colors and patterns. Beautiful, Maureen! The colors are wonderful and I love your layered focal point! Fantastic, Maureen! I love all the different pattern combinations you used here. Your green and pink colors are so fresh, too! It was fabulous to have you join the Cloud9 Inspiration Team this month!